Tokden Shakya Shri (Tib. གས་ལྡན་ཤཱཀྱ་ཤྲཱི་, Wyl. 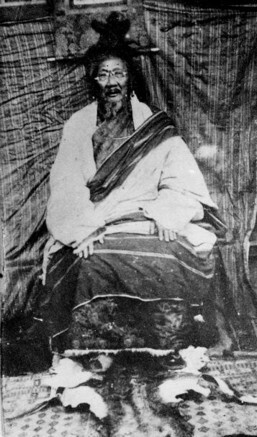 rtogs ldan shAkya shrI) aka Drubwang Shakya Shri (grub dbang shAkya shrI) (1853-1919) — a great Mahamudra and Dzogchen master. He was brought up in a Drukpa Kagyü monastery, and his main masters from that tradition were Khamtrul Tenpé Nyima and Drubwang Tsoknyi. He later met Jamyang Khyentse Wangpo from whom he received Dzogchen teachings. He established a meditation camp in Khyipuk, Central Tibet, which gathered up to 700 students in simple tents and hillside caves, and was famous for its strict discipline and zealous practice of Mahamudra and Dzogchen meditation. His students included Lama Sönam Zangpo, the grandfather of Dzongsar Khyentse Rinpoche. Shakya Shri Jñana, 'The Vital Essence' in Quintessential Dzogchen, translated & compiled by Erik Pema Kunsang and Marcia Binder Schmidt (Boudhanath, Hong Kong & Esby: Rangjung Yeshe Publications, 2006), pages 27-36. Jamyang Wangmo, The Lawudo Lama, Stories of Reincarnation from the Mount Everest Region, Wisdom Publications, 2005, pages 66-67. Kathog Situ Chökyi Gyatso, Togden Shakya Shri—The Life and Liberation of a Tibetan Yogin, translated and compiled by Elio Guarisco, Shang Shung Institute, 2009. Nyoshul Khenpo, A Marvelous Garland of Rare Gems: Biographies of Masters of Awareness in the Dzogchen Lineage, Padma Publications, 2005, pages 442-443. This page was last edited on 6 February 2017, at 23:24.